I sometimes call this photo "Earth," and I keep it in my astronomy collection. I snapped it a year ago, on the last day of my honeymoon in the Southwest. Dess and I were on a plane headed back to New York, and flying over many places we had just visited, so it was possible to recognize a few things from that far up. The way I remember it, I recognized the Grand Canyon and got the camera out, a little late; by the time I took the photo above, I did not recognize the terrain I was seeing outside the window and I feared that we'd left the Canyon behind; but I still regarded my photo as showing the easternmost reaches of the Canyon. I just figured that such a winding river must be the Colorado. I was almost right about that. 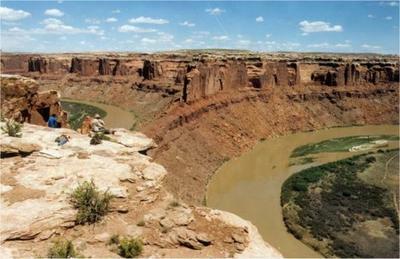 But the photo does not actually show any part of the Grand Canyon. I know because I found photos of the very same terrain on Google Earth this past week. Don't read any further if you're into the challenge and you want to try to find it yourself. Be my guest -- it took me 4 hours to find. 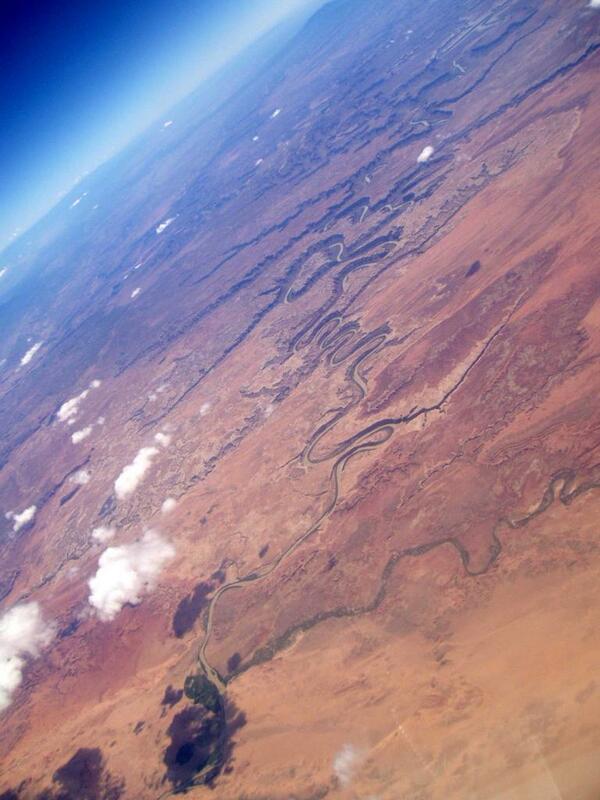 When I took the photo, the plane was actually about two hundred miles from the north rim of the Grand Canyon. If you look just above the center, you'll see something like a heart shape. It's much clearer in the next photo, taken with a zoom of 3x. Look at the top right. That "island" in the shape of a heart was actually carved out by the Green River, somewhat north of the place where the Colorado and Green rivers meet. 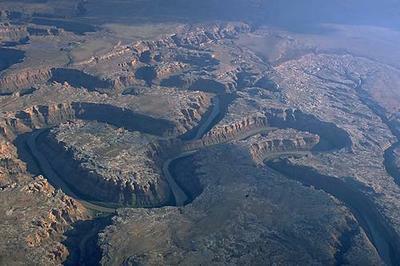 The gorge around the little island is called Spring Canyon, and it's in eastern Utah, actually not too far from Arches National Park. 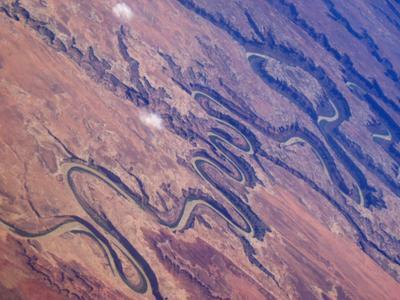 Follow the Colorado on Google Earth until it forks off into the Green River, then follow the latter to Spring Canyon: the satisfaction at finding something so visually similar to what you're looking for is quite memorable. Google Earth allows you to view any given terrain from a particular height or angle, so that you can almost pull up a facsimile of the photo above. Google Earth has amazed me so much that I feel at a loss for good words. Neither poetry not precision seems likely to convey the thrill that I've felt over this. After finding the identity of the canyon in the photo, I started looking at cities, and discovered that I could find satellite images of my own neighborhood, here in Greenpoint. I saw corners and bus stops and churches; buildings that I've lived in, including my current home; structures on the roof of my building where I've set my binoculars or rested my back; even some fuzzy blobs on the back of our apartment building, in the spots where I expected to find our kitchen windows. It was enough to make me imagine the face of the tenant, a friend of ours, who lived in our apartment before we moved in. I say that because some spots in our neighborhood where large condos are rising appear in the satellite images as they were a few years ago -- just empty lots or warehouses. Yet the World Trade Center appears as it does today, an essentially empty lot. The satellite images are composites manipulated by computers, obviously. And they do not have quite enough resolution to reveal human figures, though I did see some very light specks on the Riverside tennis courts in upper Manhattan. I saw what might have been cows in the fields of Massachusetts, near my mother-in-law's house. It's been like a trek into the past, finding my high school, college, seminary, summer camp. Ecuador, I noticed, does not have the resolution of anything in the United States. Here, streets can be resolved on the maps, probably because so many weather satellites are busy looking at us; and even little schools or restaurants can be named, due to the great wealth and collection of information. In the maps of Ecuador I could plainly see the cities, but individual streets were not resolved, much less named, so it will be a while before I find the houses of my extended family. Dess has said that it's somewhat scary to think the government can spy on us this way. I agree; the government for a long time has been able to peer at us from the skies. But I think it's beyond good that such a map of the Earth is being made available to people -- for free. Google Earth is the visual equivalent of a directory or phone book, but it also has census info and other things; and it's much more than all these things. It's the map of a planet and a home. It's in the Whitsundays, on the Great Barrier Reef. I wish I could use Google Earth but they haven't released a Mac version yet! Thanks for the link, Beche. I found a blurry blob on Google Earth which I think is right: it's a spot at 19 degrees and 46 minutes South, 149 degrees and 15 minutes East. It took me about an hour's work, but an Aussie might find it quicker. One thing, though: the resolution just isn't high enough to resolve a reef that small (at least on my free version of the program).